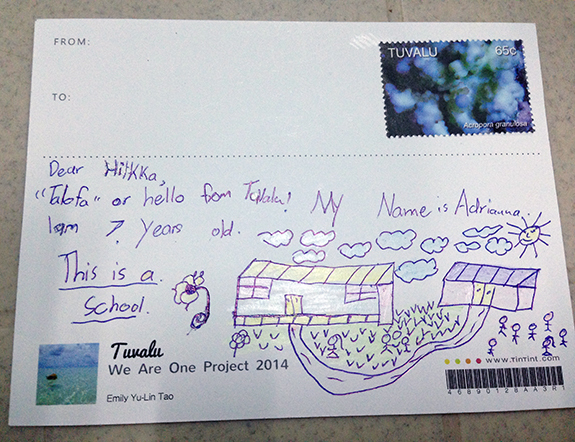 Back in May, we introduced you to “We Are One”, a project which brought Postcrossing closer to the children of Tuvalu. The project is now close to its end, and Emily sent us an update filled with really nice photos… we just had to share them with you! This project has been an amazing journey for me and the students. 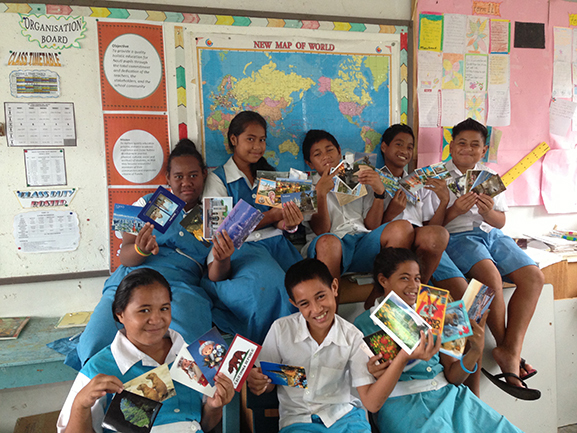 Not only were they excited to write on nicely printed postcards of Tuvalu (which is rare or never seen) and introduce it to the world, they were also thrilled to receive postcards, read the kind words from postcrossers and be amazed at the beautiful scenery pictures on a card. It is their fist time ever to learn how to read a map and name the seven continents! My greatest satisfaction, as a teacher, is to see their thirst for knowledge, wanting to learn more about this world where most countries are too far away to them. Happy children and postcards… guaranteed to make my heart melt! 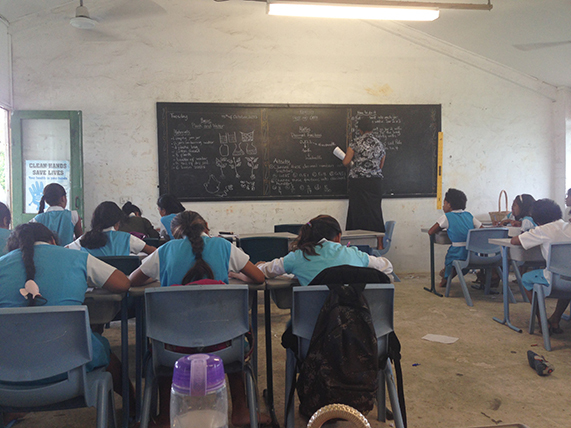 A huge thank you to Emily for setting up this year’s activity in Tuvalu – and to Taiwan ICDF (International Cooperation and Development Fund) as well, for sending her there and helping fund her postcard project! Project "We Are One" - Tuvalu on Postcrossing! 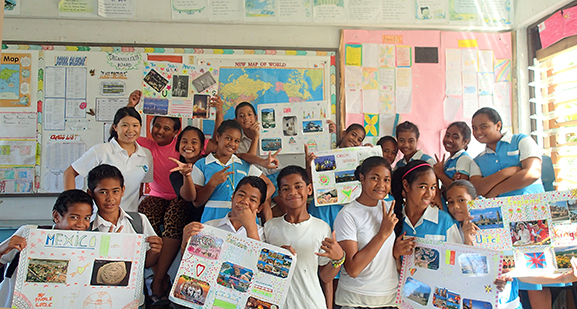 Remember some years ago, when a class of students in Tuvalu sent postcards to raise awareness for the plight of their tiny country? "Being one of the smallest and most remote nations in the world, it’s easy to miss out Tuvalu on the map. 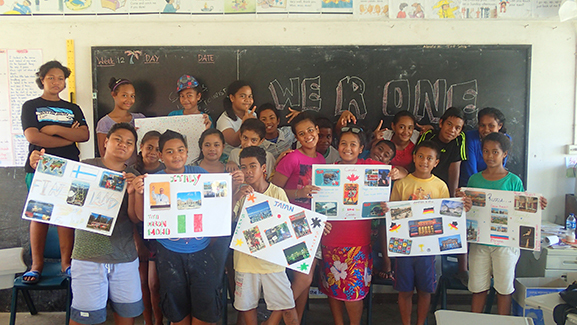 Through postcard exchanging, we wish to make this island country more known to the world; hence the idea of “We Are One Project” was born, which aims to connect Funafuti’s (the capital island) Primary School children with postcrossers from all over the world. Students will benefit from writing postcards in English, further motivating them to become better writers… or simply to have more enthusiasm in learning English! Once we receive postcards, students will be assigned to do studies and research on different country’s unique culture or history. They will be amazed at the fact how big the world is; bigger than they had thought, beyond the skyline of coconut trees and the sea. Through this project, we hope to help our children be more connected with the rest of the world, and understand that we are all part of it, for better or worse, WE ARE ONE WORLD. " How wonderful is that? :) They’re planning to send around 400 postcards, and the first ones are already on their way! If you’re lucky, you might receive or send one to them! Oh! And if you didn’t know where Tuvalu is, or want to learn more about this Polynesian island nation, don’t forget to check out their page on Wikipedia. PS – We know that Tuvalu is a “rare” country, but Emily and the children won’t be able to engage in direct swaps for the duration of the project. So please respect their choice, and don’t contact them requesting for swaps. Earth day 2010 + Tuvalu = Postcards! On April 22nd it will be Earth Day 2010 and, in a time when climate change is becoming more serious than ever, it’s important to not let this day go by unnoticed. 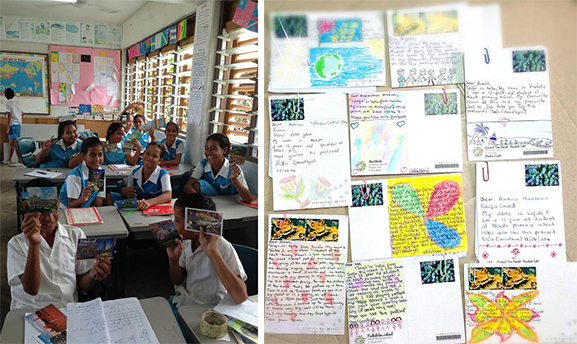 Postcrossing is collaborating with students in Tuvalu in a very special event around the Earth Day 2010 in which you can participate too – and it’s really easy, read on. Formerly known as the Ellice Islands, is a Polynesian island nation located in the Pacific Ocean, midway between Hawaii and Australia. Its nearest neighbours are Kiribati, Nauru, Samoa and Fiji. It comprises four reef islands and five true atolls. Its population of 12,373 makes it the third-least-populated sovereign state in the world. From all the important facts about Tuvalu, there’s something particularly important that you should: due to global warming and the rising of sea-level, there are predictions that in the next 50 years the entire population will have to be evacuated. The ocean can swallow Tuvalu whole, making it the first country to be wiped off the map by climate change! Isn’t that scary? Tuvalu students certainly think it is, and so do we. Postcrossing is proudly collaborating with them in this year Earth Day to help spread their word about how important it is to reflect and act upon climate change. The project is called “Send Tuvalu to the world” and consists on sending 422 postcards to all over the world sharing their thoughts about Tuvalu. The students organized a painting contest to draw a special stamp to be used in all the postcards, so these are very special indeed. Just leave a comment on this Postcrossing blog post saying you would like one. We will then select the receivers from the first users of each country until we reach the needed 422 addresses. There are many possible slots for each country, so be sure to leave a comment! We will then share your address with the organization of this event in Tuvalu and the students will send your way one of this very special postcards. It’s really simple to participate. But also very important, is to be aware – more than ever – about climate change, what it is doing to our planet, and what we should do about it.